(Roche Abbey) a house of White Monks; a very finely built house of freestone and covered with lead (as the abbeys in England, as well as the churches are). An uncle of mine was present at the breaking up of the abbey, for he was well acquainted with several of the monks there. When the community was evicted from the abbey, one of the monks, his friend, told him that each monk had been given his cell where he slept, wherein there was nothing of value save his bed and apparel, which was simple and of little worth. This monk urged my uncle to buy something from him, but my uncle replied that he could see nothing that would be of any use to him; the monk asked him for two pennies for his cell door, which was worth over five shillings; his uncle refused, as he had no idea what he would do with a door (for he was a young unmarried man, and in need of neither a house nor a door). Others who came along later to buy the monks corn or hay found that all the doors were open, and the locks and shackles plucked off, or the door itself removed; they entered and stole what they liked. Some took the service-books that were in the church and laid them on their Waine Coppes to repair them; some took windows from the hay barn and hid them in the hay, and did the same with other things: some pulled iron hooks out of the walls  but did not buy them  when the yeomen and gentlemen of the country had bought the timber of the church. 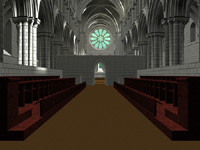 For the church was the first thing that was spoiled; then the abbots lodging, the dormitory and refectory, with the cloister and all the buildings around, within the abbey walls. For nothing was spared except the ox-houses and swinecoates and other such houses or offices that stood outside the walls  these had greater favour shown to them than the church itself. This was done on the instruction of Cromwell, as Fox reports in his Book of Acts and Monuments. It would have pitied any heart to see the tearing up of the lead, the plucking up of boards and throwing down of the rafters. And when the lead was torn off and cast down into the church and the tombs in the church were all broken (for in most abbeys various noblemen and women were buried, and in some kings, but their tombs were no more regarded than those of lesser persons, for to what end should they stand when the church over them was not spared for their cause) and all things of value were spoiled, plucked away or utterly defaced, those who cast the lead into fodders plucked up all the seats in the choir where the monks sat when they said service. These seats were like the seats in minsters; they were burned and the lead melted, although there was plenty of wood nearby, for the abbey stood among the woods and the rocks of stone. Pewter vessels were stolen away and hidden in the rocks, and it seemed that every person was intent upon filching and spoiling what he could. Even those who had been content to permit the monks worship and do great reverence at their matins, masses and services two days previously were no less happy to pilfer, which is strange, that they could one day think it to be the house of God and the next the house of the Devil  or else they would not have been so ready to have spoiled it. But it is not a thing to be wondered at by such persons that mark the inconstancy of the rude people in whom a man may graft a new religion every day. Did not the same Jews worship Christ on Sunday, who had done so much good to them, yet on the following Friday cried Crucify him? Thus you may see that those who thought well of the religious, and those who thought otherwise, agreed enough to spoil them. Such a devil is covetousness and mammon! And such is the providence of God to punish sinners in making themselves instruments to punish themselves and all their posterity from generation to generation! For no doubt there have been millions of millions that have repented since, but all too late. And this is the extent of my knowledge relating to the fall of Roche Abbey.